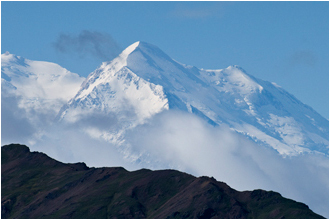 Mount McKinley popped out of the clouds for a few brief moments yesterday and I quickly captured its north peak from Polychrome Ridge. 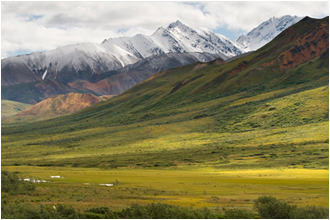 The ‘great one’ as it is referred to by locals, is not the most photogenic mountain, but gains its fame as being the highest mountain in North America. It is 20,320 feet high, 18,000 of which rises above the plateau compared with Mount Everest, the world’s highest mountain, but which only rises some 11,000 feet above its plateau. Our last excursion into Denali National Park consisted of rain, sleet, snow, flat light and a 12 hour bus ride to Wonder Lake and back. Wonder Lake was completely anti-climatic particularly with the elusive Mount McKinley completed cloud-engulfed. 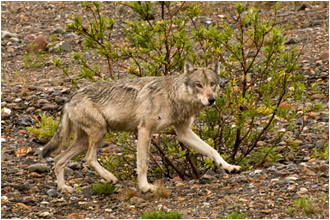 However, it was the highlight of the trip for me, as the local alpha-male of the wolf pack near Sable Pass trotted down the riverbed right beside us. His scarred face and shoulder are testament to the warrior like existence of these creatures whose whole lives revolve around getting enough food to survive, and protecting their ranges. 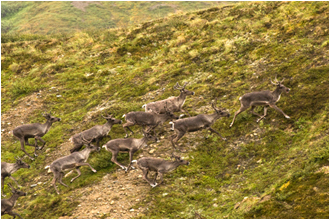 As well, breeding season for the ungulates is nearing and the caribou are beginning to form small herds. We also observed several more grizzlies along the way. As a result of the bad weather this year the berries are going to have a very brief season and the bears are having a tough time getting enough to eat. 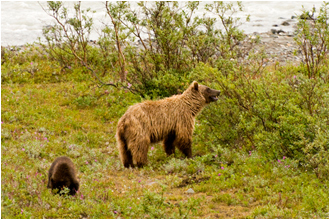 The bears in Denali do not have the luxery of their coastal counterparts to feed on salmon in the rivers. 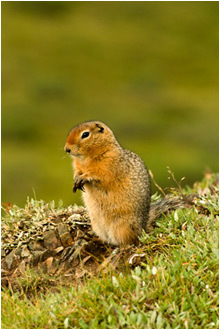 In Denali they rely 80% on vegetation and a few arctic ground squirrels for protein. We observed a female grizzly and her cub chase a ground squirrel down its hole and then furiously dig after it. These bears are known to toss boulders the size of refrigerators out of the way just to get at their 2500 calorie squirrel snacks. Tonight we are going to attempt to find a place to dry out our gear and then head to Anchorage for the next phase of the trip.